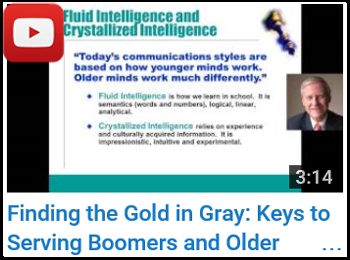 Michael Sullivan, CEO, 50-Plus Communications Consulting, is a foremost expert at training sales staffs how to sell more to Boomers and older clients. Michael Sullivan works with firms using lifestyle issues relating to selling and servicing Boomers and older clients. He is CEO of 50-Plus Communications Consulting, specializing in helping make financial advisors wiser, more compassionate and significantly more effective advisors. Major clients include the Bank of America, Wells Fargo, Citibank, Goldman Sachs, MetLife, The Hartford. Mike served as head of Corporate Communications, First Union National Bank (now Wells Fargo) in Charlotte. Michael Sullivan He has a journalism degree, University of Detroit and an M.B.A., Wayne State University. He is a recipient of the Monroe T. Gilmore award for service to seniors adults in Charlotte. Mike has written seven how-to books, e-manuals and guides for selling to Boomers, including 101 Easy Ways to Increase Business with Boomerplus Clients and Banking on the Mature Market. Mike is a monthly columnist for www.retirementhomes.com where you can find more than 60 of Mike’s columns. 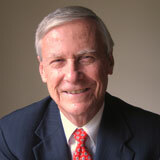 He serves as a member of GRANDmagazine Advisory Board, the on-line magazine for grandparents. 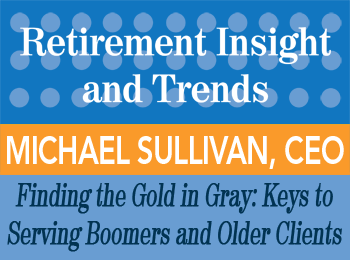 Read a summary transcript of Michael Sullivan’s presentation Finding the Gold in Gray: Keys to Serving Boomers and Older Clients in the December, 2015 issue of “Retirement Insight and Trends”. Have Michael Sullivan speak at your event! Michael Sullivan is an experienced speaker and keynote presenter on topics pertaining to retirement and the aging Boomer population. Find Michael Sullivan at National Speakers Association www.nsaspeaker.org.